The proportion of OPSCCs that were p16-positive increased among patients ≥65 years old. 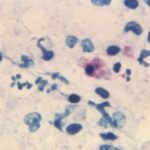 HealthDay News — Human papillomavirus (HPV)-positive oropharyngeal cancers are increasing among older adults, according to a study published online April 30 in Cancer. Melina J. Windon, M.D., from Johns Hopkins University in Baltimore, and colleagues retrospectively studied 239 cases of oropharyngeal squamous cell carcinoma (OPSCC) diagnosed at two National Comprehensive Cancer Network-designated cancer centers (1995 to 2013). P16 immunohistochemistry and in situ hybridization (ISH) for HPV-16, high-risk DNA, and/or E6/E7 RNA were performed. Age at diagnosis was compared by p16 and ISH tumor status. The researchers found that 60 percent of patients were p16-positive. Over the study period the median age increased among p16-positive patients (P trend = 0.01) from 53 to 58 years, but not among p16-negative patients (P trend = 0.71). The proportion of OPSCCs that were p16-positive increased among patients ≥65 years old, from 41 percent during 1995 to 2000 to 75 percent during 2007 to 2013 (P trend = 0.04). Regardless of age, a p16-positive tumor status improved overall survival. “The median age at diagnosis for HPV-related OPSCC is increasing as the proportion of OPSCCs caused by HPV rises among older adults,” the authors write. One author is on the scientific advisory boards of Medtronic and Olympus and is a consultant for Ziteo.